Oxford is launching an innovative promotion to give riders the chance to get their hands on brand new Oxford Lifetime Luggage in exchange for their old kit. 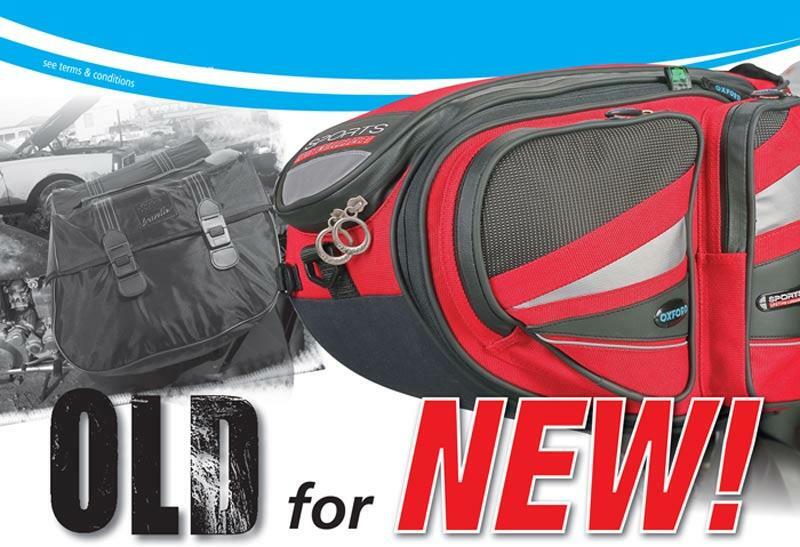 This one-time offer enables bikers to part-exchange their old motorcycle luggage (any make) for new Oxford Lifetime Luggage and receive a guaranteed value for their old gear of up to £40. One old piece of motorcycle luggage may be part-exchanged at a participating dealership for one new piece of Oxford Lifetime Luggage – without exception, this is a one for one offer. Any individual may part-exchange up to 3 items of luggage, so they could end up with a full set (panniers, tank bag and tail pack). Motorcycle luggage exchanged for a new set of Oxford panniers will give you a £40 part-ex value. Luggage exchanged for a new tank bag or a tail pack is worth £35. These values will be deducted from the full 2009 RRP of the Oxford luggage items. The offer expired 31 July 2009 and is limited by availability of stock. For more details, visit www.oxprod.com or call 01993 862300.